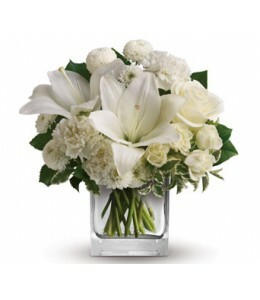 Give the gift of serenity with a graceful and contemporary arrangement of lilies, carnations and greens.Flowers are subject to seasonal availability. 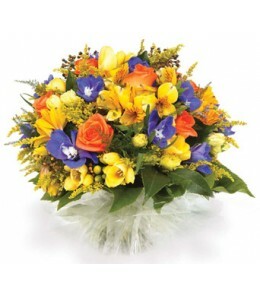 In the event that any of the flowers are unavailab.. 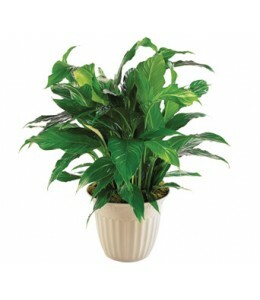 Known as a "Peace Lily," this spathiphyllum plant with its dark green shiny leaves produces lovely white flowers all year.Plants are subject to seasonal and regional availability. In the event that th.. 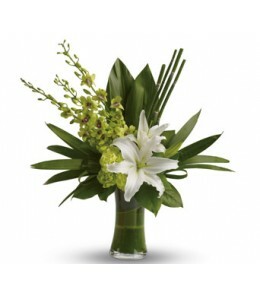 The graceful beauty of white lilies and opulent orchids is highlighted with an artistic, emerald-green backdrop of tropical leaves presented in a leaf lined vase.Flowers are subject to seasonal availa..
Beautiful and breathtaking as a sunset. 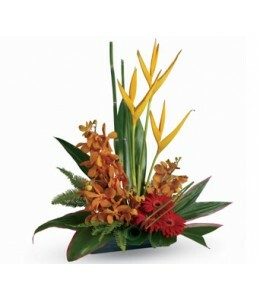 This bouquet contains lilies, roses and mini carnations in ravishing shades of oranges and reds.Flowers are subject to seasonal availability. In the event that .. It's no wonder so many people are crazy about daisies. 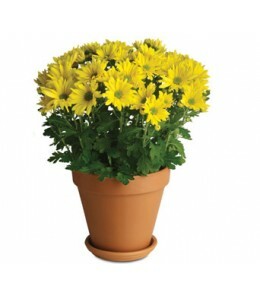 Daisy chrysanthemums, that is.Plants are subject to seasonal and regional availability. In the event that the requested plant is unavailable, the..
Now this is bliss! 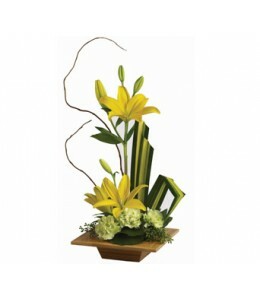 This tropical and tasteful creation is a beautiful and dramatic way to say something wonderful without using any words.Flowers are subject to seasonal availability. In the event tha.. 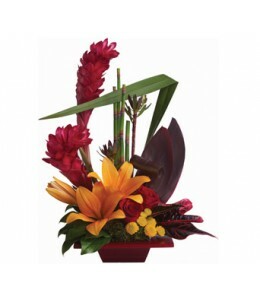 This gorgeous arrangement, with its bold, beautiful flowers and foliage, offers some of the best of the tropics.Flowers are subject to seasonal availability. In the event that any of the flowers are u..